Just Announced - Hillary Rodham Clinton at #SVLeaders 2018! 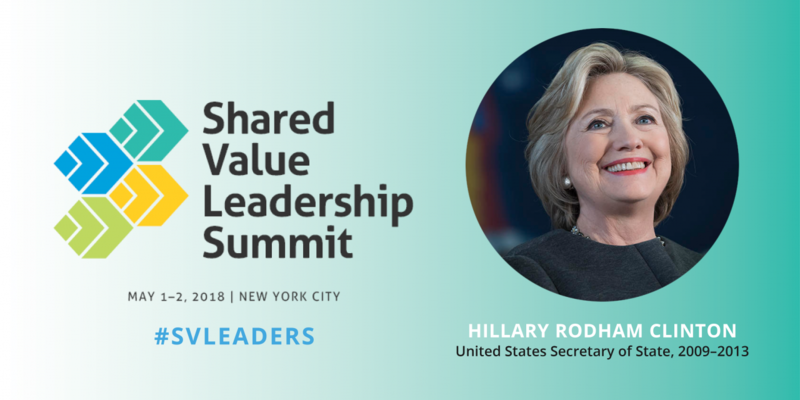 BOSTON, March 19, 2018 /3BL Media/ - The Shared Value Initiative is thrilled to announce that former U.S. Secretary of State Hillary Rodham Clinton will headline the 2018 Shared Value Leadership Summit on May 1-2, 2018 at the Conrad New York. Secretary Clinton will be joining other thought leaders and engaging in a dialogue on the role of business to drive scalable solutions to societal challenges, and on broader trends in the socio-political conditions that make now the time for business to innovate for shared value. In addition to Secretary Clinton, the 2018 Shared Value Leadership Summit will feature Jennifer Dulski - Facebook; Deval Patrick - Bain Capital Double Impact; Kathleen McLaughlin - Walmart; Rajiv Shah - The Rockefeller Foundation; Alan Murray - Fortune; Alessandro Benetton - 21 Partners and many more. Act now and secure your seat today! The challenges the world faces in 2018 require bold thinking and large-scale transformational change. Business has the power to lead that change and shared value is the key strategy that executives have to make it happen in an impactful and profitable way. At the 2018 Shared Value Leadership Summit we’re diving deep into the world’s greatest opportunities—access to medicine, clean energy, smart technologies and workforce opportunities—with the women and men who are taking shared value strategy from the board room to shared value reality on the ground.